Publicity-shy teenager Morgan Parker would love a day free from scandal, but her tabloid-fodder family can't help making idiots of themselves in public. 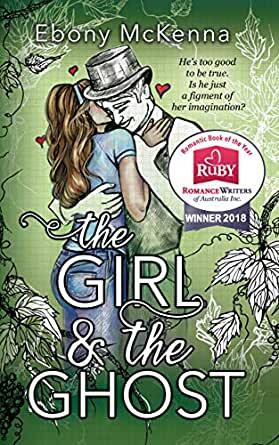 So when a confused - and a little bit gorgeous - ghost by the name of George Sebastian Wallace shows up in her room, Morgan welcomes the distraction from the chaos of her real life. As Morgan gets to know George, she helps him unravel his family’s secrets. A research trip to the cemetery with George turns into a social media sensation as the paparazzi have a field day capturing Morgan apparently talking to herself. The rest of the world can't see George, only Morgan can. Suddenly social media can’t get enough of Morgan and her 'imaginary friend'. Now Morgan's the one creating gossip and she hasn't a clue how to stop it. This is the story of Morgan Parker, a teen with a distant father and a mother and brother chasing celebrity. Morgan’s life is pretty typical for a rich girl who has everything except privacy. She has great friends and parents who love her. The only real blot is the fact that her parents decorated her room in the historical home they purchased a violent pink. Something she probably wanted ten years ago. And then there is the ghost. George Sebastian Wallace was a rich young man of his 1880 time. And rather a cute one. Morgan’s room used to be his room. The journey these two embark upon is sweet and challenging for both of them. A very enjoyable teen story with a lovely ending. This is a book for the young-at-heart adult, a sweet tender romance with a satisfying HEA. Morgan is a teenager struggling with all the agonies of being a 15year old, exacerbated by living in a family that would give the Kardashians a run for their money. When the family moves into an old mansion that has been transported to a site in the fashionable end of town, she finds to her horror that not only is her mother's idea of decorating of Morgan's bedroom is every shade of pink but the room also comes with the live in ghost of an attractive young man. George is the perfect boyfriend, courteous, charming and devilishly good looking. Pity he's dead. Her search for George's history brings the ever present tabloid press that one step too far and Morgan's world comes crashing down. I adore Ebony's stories and this is by far the best so far. Highly recommended for the YA and the YAH! This story was so much fun! The thing I loved about it was the way the culture clash was portrayed between Morgan and 'her' ghost. The romance was sweet and swoony. An easy and enjoyable read! This is a wonderful tale to enjoy on a rainy weekend, as it will keep you glued to your lounge chair. Recommended. 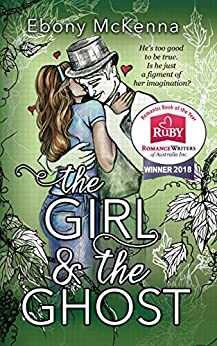 ***I received a free copy of this book in exchange for an honest review*** This is a sweet romance and an interesting commentary on how obsessed the modern world has become with their technology and social celebs. Though, I’ve never been a fan of reality TV, and I can’t stand the Kardashians (they always feel so fake, obnoxious, and put on over the top dramatics), so I wasn’t able to really relate to Morgan and her family. It also didn’t help that Morgan felt more like 13 and in the middle of teenage over dramatics herself as well as being rather self-centered (she really didn’t seem to care much about the outside world other than how her family was being publicized on the media sites, her brothers, Dave, or her father even). (And I thought it was rather laughable that she thought herself normal, and didn’t seem to see anything out of the ordinary being raised by a nanny with 5 star cuisine for every meal). (Even George seemed over the top in dramatics, too, and her friends really weren’t that much of an improvement over Morgan’s family with their superficial gossiping, giggling all the time, and absorbed with their phones-though that all did feel typical for pre-teens). I also really don’t understand the modern obsession with technology, so I had no sympathy when she had to give up her phone for a day and had to go back to *shudder* handwriting (I do plenty of handwriting during the day and when my phone dies, sometimes I don’t notice for several days). The romance is cute, though with Morgan’s age at what felt like boy-crazy 13, you wonder just how much of that romance was real. Still, its an interesting commentary on today’s society and what might the past might think of it. I really liked this sweet and simple story mostly. It was a quick and easy read albeit somewhat juevenile. The only characters I enjoyed were Morgan and George (the girl and the ghost respectively) as I found the other characters very hard to like. Morgan is a rich and well known teenager. She doesn't like the spotlight which seems to be the opposite of the rest of her family. I disliked her "friends", although I suppose they were typical teenagers. Gossipy, giggly and annoying. Morgan's brother and mom were even worse. I started to skip over the scenes her mom was in, I think the book could have been better without her. She was crass and craved attention. George is the ghost of a young man that lived in the house Morgan's father bought and had moved to another location. Some of the things I don't understand...where was George before the house was moved? Why is Morgan the only one who can see and hear George in the beginning? Why all of a sudden can Morgan's friends and family hear and see George? Why is George still around after his "business" is concluded and he has closure? I would recommend this book to a younger (than me) audience, maybe middle schoolers. I cried (sobbed really) the last two chapters of the book. It was good and I am glad I was given the opportunity to read and review it. Morgan Parker is such an interesting teen with a very odd family to have to deal with. She is in the public attention being dubbed the princess of plastics. Her family is very wealthy and have moved a house to a new city, along with the house they brought a ghost by the name of George. George shows up in clothing from his century and Morgan becomes real good friends with George. Her school friends don't believe her of course, neither does her family. George is there for Morgan through so many various trials that come along in life. They become very close and develop feelings for each other. And if you want to know more you will have to read this amazing book. I picked it up and could not put it down. You will love this book. I was given an advance reader copy of this book and this is my honest review.